Gorkha Janmukti Morcha president Bimal Gurung today lashed out at the Trinamul Congress for allegedly vitiating the peace in the hills and held a trade union affiliated to the ruling party responsible for the "suspension of operation" in Tukvar tea garden. The estate in Gurung's GTA constituency is shut since Christmas day after an alleged attempt was made by Trinamul leader, Sadhav Mukhia, to attack the manager of the garden, Rajesh Pareek. 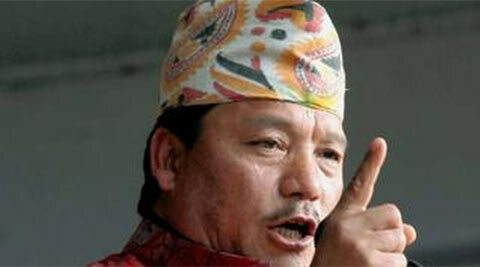 In a written statement, Gurung said: "Trinamul which has spread terror in the plains has started vitiating the peaceful atmosphere in the hills... the future of the 1646 workers has been pushed into uncertainty after Jai Shree Tea and Industries Limited was forced to declare a lockout. Following the lockout, if any law and order situation arises in the garden, the Trinamul tea union, Darjeeling District Tea Employees and Workers Union, will be held responsible." The Morcha president urged the administration to act against the accused and the management to reopen the garden as early as possible. In an FIR filed by the management of Tukvar garden, it was mentioned that Mukhia, the president of the Trinamul union's estate unit, and others had tried to attack Pareek with knives. Trouble started after the garden management had decided not to allocate work to labourers during the winter unless they had put in 120 days of work this year. J.B. Tamang, the general secretary of the Trinamul union, alleged that the Morcha and the management had colluded to shut the garden.